The UofL Digital Media Academy (DMA) is a one-week day camp for rising sixth-grade girls from Atkinson Elementary, Lincoln Elementary, and Cochran Elementary schools. In this digital production camp, girls play with and learn to produce several types of digital projects: movies, podcasts, and image manipulations. The camp is free to attend, including lunch. Girls each receive a camp t-shirt, which they will be expected to wear daily, and a new iPod touch. All activities of the camp take place on the University of Louisville Belknap Campus. 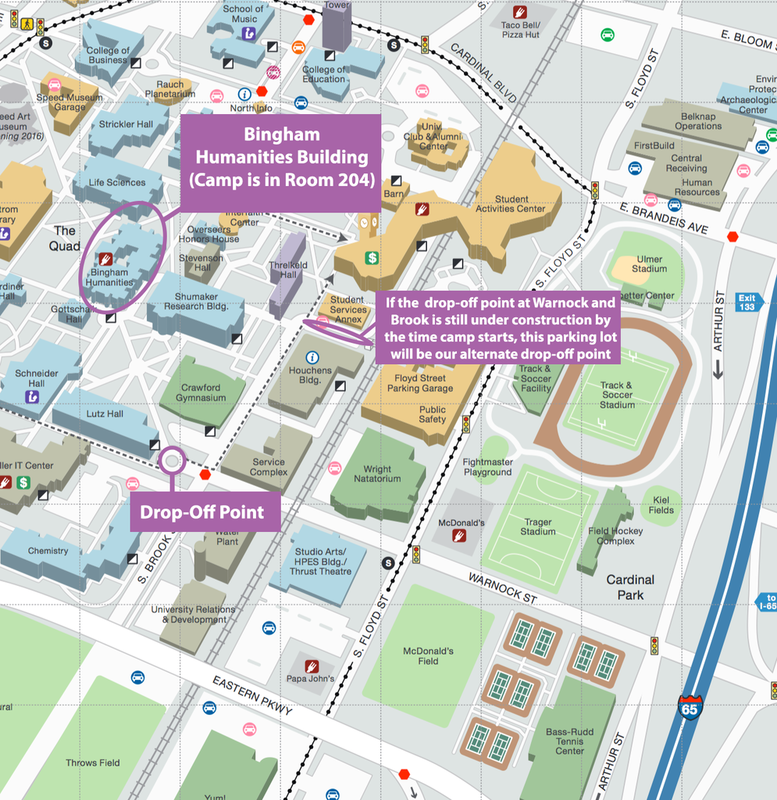 The majority of the camp is held in Bingham Humanities Room 204, a new 20-computer Mac lab. Campers go on several on-campus field trips, visiting libraries, science labs, and innovation centers. Lunch is provided from The Ville Grill. Girls will be escorted by camp counselors to and from drop-off points, the lunchroom, and any field trip locations. Girls each receive their own new, free, WiFi-enabled iPod Touch, with earbuds, for taking pictures and video over the course of the camp. During the camp, the iPod Touch will remain with camp teachers for safekeeping and charging (and to make sure that each girl has her device every day). At the end of the camp, girls will take home their iPod Touch. Camp begins promptly at 9 am and ends at 4 pm. Girls will need to be dropped off at the University of Louisville between 8:45 am and 9 am each morning. Note that you cannot park in the traffic circle, but there may be metered parking available on 3rd street if you need to park for any reason. There are also sometimes spots available in the parking lot next to the North Information Center. If you are late, contact Annelise Gray at 502.852.0505 to find out where we are meeting and then walk your camper to the group. Girls will need to be picked up at the same spot every afternoon. The pick-up time will be between 3:50pm and 4:00pm. Enter campus off S. Floyd Street. If you are coming from the North, turn right onto Warnock. If you are coming from the South, turn left onto Warnock. If a student arrives after 9:15 (more than 15 minutes after the start of the camp day), she will be considered late. Two late arrivals will be considered one absence. A pickup will be considered late if you pick up your camper after 4:15. Two late pickups will be considered one absence.